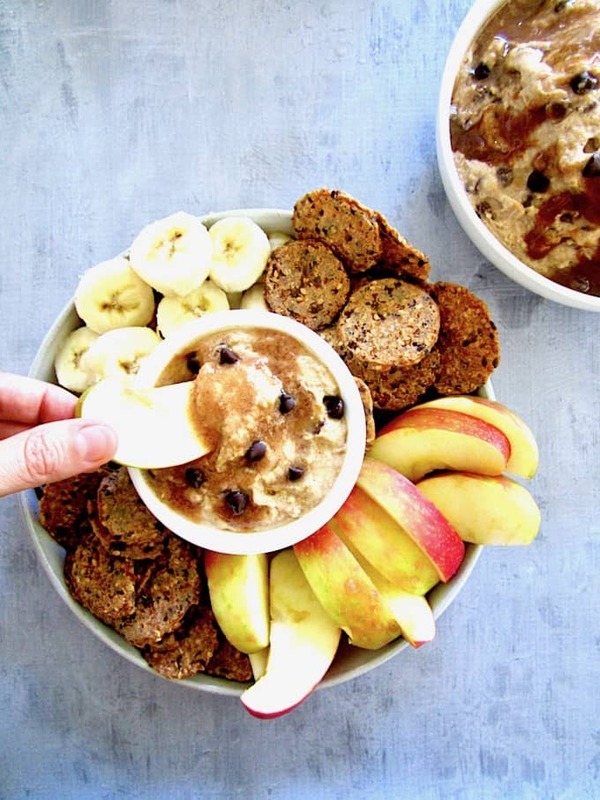 This healthier chocolate chip dip dessert hummus is a sweet spread made from chickpeas and flavored with almond butter, maple syrup and mini chocolate chips – all topped with an easy caramel sauce. Filled with protein and fiber, this dessert or snack is also vegan, gluten free and refined sugar free (+ a total sugar free option)! 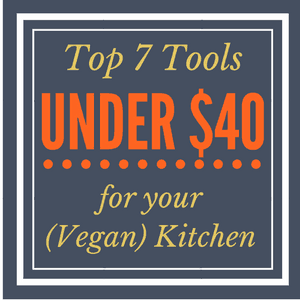 Thank you for supporting the brands that make it possible for Vegan Chickpea to provide free recipes and healthy plant-based living inspiration. When I was a kid, I used to relish eating my mom’s cookie dough right out of the stand mixer, including the bowl, beaters and spoon. Heck, who am I kidding… as an ADULT I still LOVE eating cookie dough, oftentimes more so than the baked cookie itself. Anyone else? This chocolate chip dip is reminiscent of chocolate chip cookie dough. I call it dessert hummus because the base is made out of chickpeas, just like hummus. Instead of tahini, I used almond butter. Instead of olive oil, here we use maple syrup to make it sweet instead of savory. 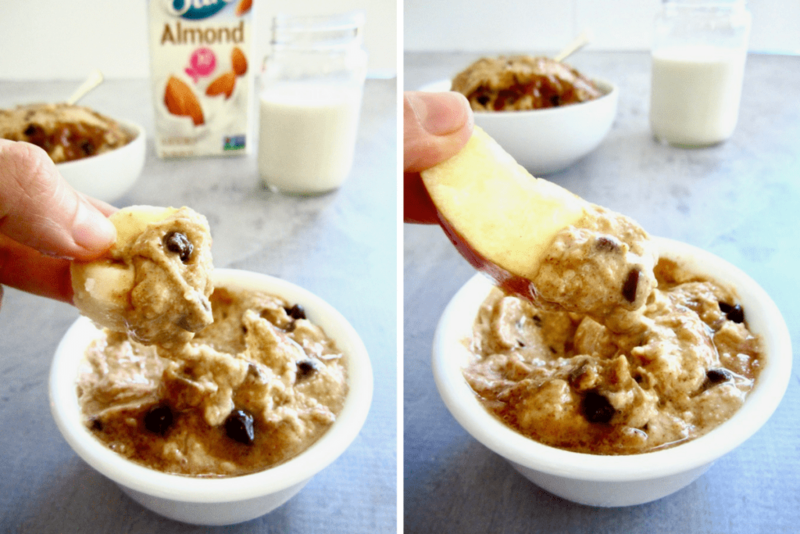 Toss in some oats, Silk® Unsweetened Vanilla Almondmilk, vanilla extract and salt and we have ourselves a sweet, protein-packed dessert hummus! The caramel sauce really adds another dimension of flavor. I love this stuff! I first created it as a topping for my Slow Cooker Pumpkin Quinoa Breakfast Bowl and now make it often – sometimes blending frozen bananas and topping it with this caramel sauce as a healthy treat! As far as desserts go, this is definitely a healthier option as it’s entirely refined sugar free. To make this completely sugar free (which is what I did), I used stevia sweetened chocolate chips and monkfruit ‘maple syrup’ in both the caramel and the hummus – yay for no sugar spikes! 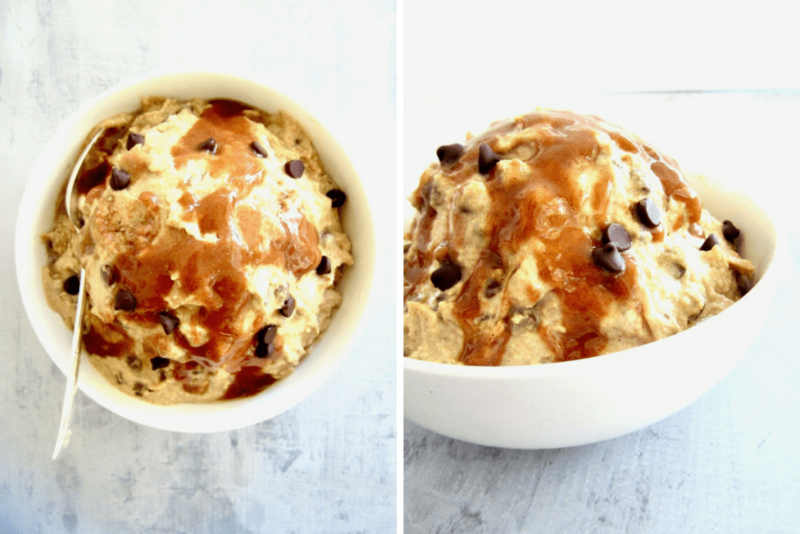 Plus, the great thing about vegan cookie dough is – no eggs! Unlike when I was a kid and my mom would be wary of salmonella (though I still ate the raw dough anyway… I guess she couldn’t resist my begging), we’re all clear from food poisoning with this edible plant-based version – whoop whoop! The consistency of this dip, when first made, is thin, more akin to hummus. Once refrigerated, it firms up and is more like a hardened cookie dough. 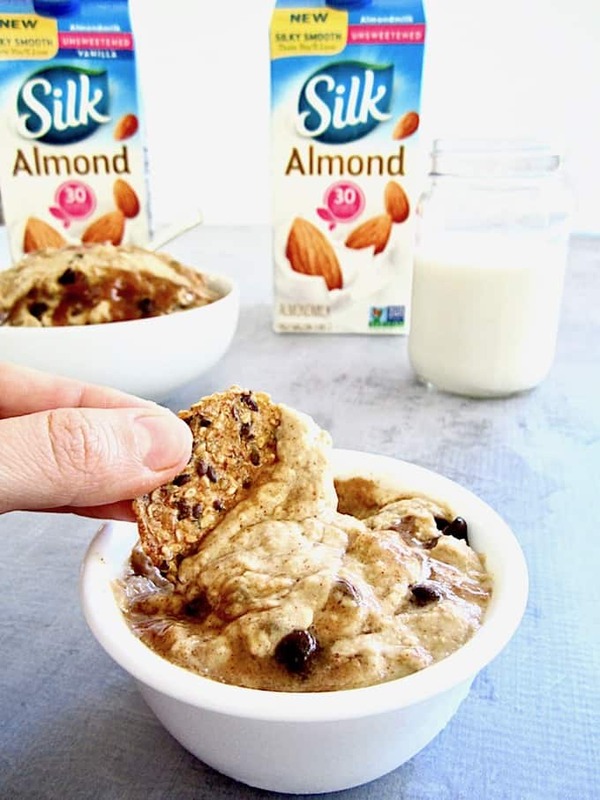 You can play with the consistency depending how you like it, adding more Silk® Almondmilk as needed if you want it thinner. 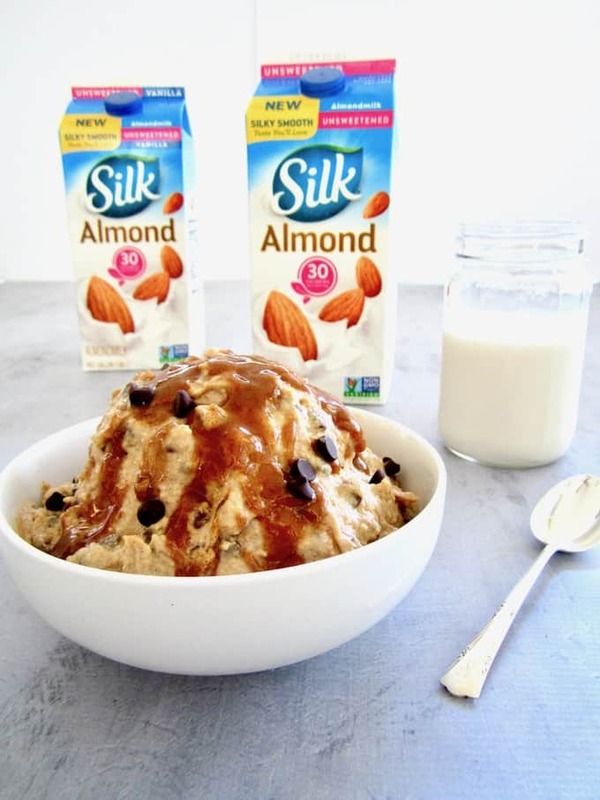 I used Silk® Unsweetened Vanilla Almondmilk in this recipe since it has no sugar, but you can also use the Silk® Vanilla or Light Vanilla Almondmilk. Did you know that Silk® Almondmilks have a new, silky smooth taste? I love how non-dairy milks continue to just get better and better these days – it really makes the vegan lifestyle a breeze! 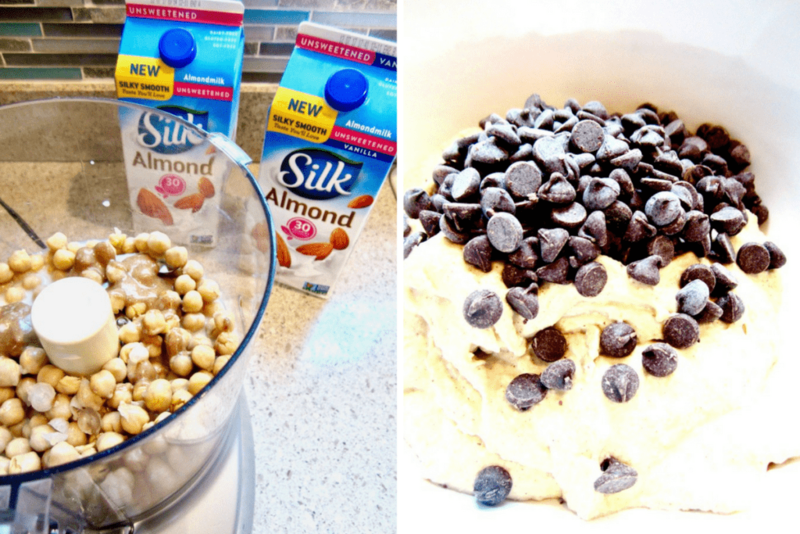 Simply swap Silk® products into any recipe for regular milk, it’s that easy. Plus, it’s non-GMO, gluten free, has 50% more calcium than dairy milk, and absolutely no cholesterol or saturated fat. Three cheers for plant-powered nutrition! 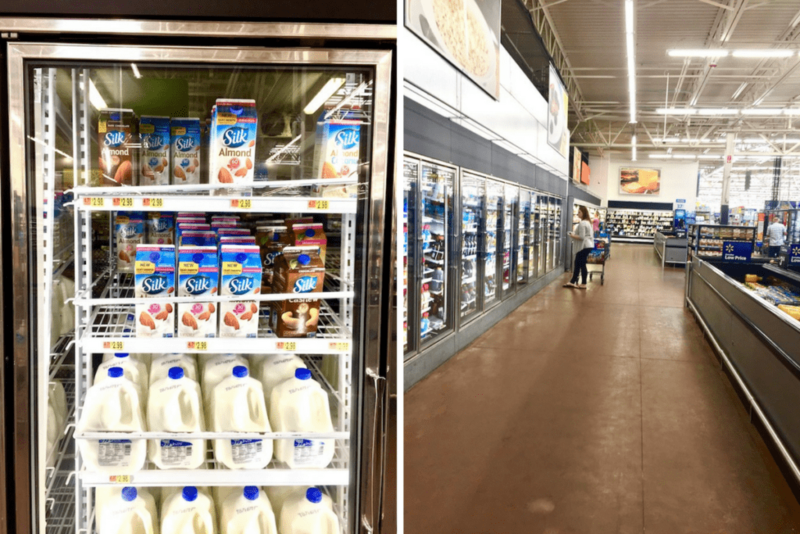 As usual, Silk® Almondmilk is available at Walmart – look for the yellow label on the top right for the reformulated products (see photo below). You can find it in the dairy aisle, in the fridge right near the cow’s milk. Right now I’m on an island in North Carolina that just has a small market, so every couple of weeks I take the ferry over the mainland and Walmart is just a few minutes drive away – thankfully they carry non-dairy products like this that I can stock up on for my everyday (and now the upcoming holiday) cooking and baking! I always have both unsweetened vanilla and plain unsweetened almondmilks on hand, depending on how I’m using it. Chocolate Chip Dip – Dippers! Now – what to dip in this dessert hummus? It was great with sliced apples, sliced banana and – surprisingly – hearty seed crackers. The sliced apples with the chocolate chips and caramel sauce was reminiscent of caramel apples – yum! How do you like to dip? Any other suggestions? Let me know in the comments below! Combine all ingredients for the hummus except the chocolate chips into a food processor and combine until smooth. Taste and add more sweetener or almond milk to get your desired consistency. It will thicken upon refrigeration. Transfer to a bowl and stir in chocolate chips. Place mixture into the fridge if not eating right away, or if you want the hummus to firm up and/or be cold. The taste and texture is more like cookie dough when it's chilled, but more like hummus when not chilled. CARAMEL SAUCE: If your coconut oil is solid, melt on the stove until liquified. Remove from heat. Whisk in remaining ingredients until well mixed and set aside. Before serving, pour the caramel sauce over the bowl of hummus and serve with dippers of your choice! You may want to start with half the caramel and add the other half later to even distribute the caramel as you eat it. Keep any leftovers refrigerated. Note: Once refrigerated, the caramel will harden, but will start to melt again if left out at room temperature. *For the sweetener, you can sub other liquid sweetener like date syrup or agave. You could also use coconut sugar. You may need to add more sweetener - I don't like to make my desserts overly sweet, but you may find you need to add more for your taste. Remember you'll also be adding chocolate chips and caramel to the hummus base. *To make sugar free: I used this sugar free, monkfruit sweetened 'maple syrup' in both the hummus and caramel sauce, and these stevia sweetened chocolate chips . I think you had me at dessert hummus!!! *drool* a sweet hummus? Looks oh so good! Ha ha!! Yes, it is! ;) Thanks! Uh, this sounds amazing. Not only as I already addicted to regular hummus, not you are telling me I CAN have it for dessert?! Bye, bye skinny jeans! Can I use regular oats instead of gluten free oats?